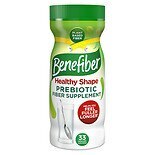 Shop Benefiber Non-Thickening Powder, Sugar Free Unflavored, 38 dose (5.4 oz. )5.4 oz. $1199$11 and 99 cents$2.22 / oz. 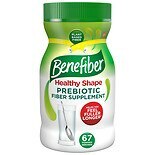 Shop Benefiber Non-Thickening Powder, Sugar Free Unflavored, 125 dose (18 oz. )18 oz. Shop Benefiber Non-Thickening Powder, Sugar Free Unflavored, 62 dose (9 oz. )9 oz. Fiber is an essential part of a healthy diet, but many people don't get enough of it. 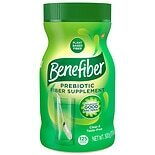 Benefiber Powder is an easy way to add more fiber into your diet, which could help promote better health. Benefiber Powder contains a natural form of soluble fiber. This tasteless supplement can be used in cooking or drinks to instantly add more fiber to your diet. Fiber helps food and waste to pass smoothly through the digestive system, which is important for maintaining your health. The American Heart Association recommends a regular fiber intake of 25-30 grams a day. Although fruits, vegetables and whole grains contain some fiber, many people find it difficult to consume enough of these foods on a regular basis to meet the recommendations. 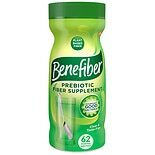 If you struggle to eat enough high-fiber plant foods, then Benefiber Powder could allow you to access all the health benefits of natural soluble fiber, without having to turn your usual diet on its head. It's a small change that could make a big difference to your digestive health. Using Benefiber Powder is the easy way to add more fiber into your diet. It is completely tasteless and non-thickening, so you can add it to any non-carbonated drink or soft food. You can even use the product in cooking without damaging the beneficial effects of the fiber. Stir Benefiber Powder into your favorite drink or food to create a smooth texture that you can enjoy. With just a couple of spoonfuls of Benefiber Powder, you can boost the fiber content of your favorite yogurt or pudding and feel good about indulging yourself. On the other hand, if you're watching your weight, you might be pleased to learn that it's completely sugar-free. The only ingredient is natural wheat dextrin, which contains three grams of fiber and only 15 calories per two-tablespoon serving. 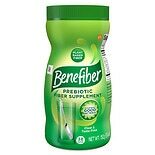 If you struggle to get enough fiber, Benefiber Powder could be a convenient and healthy solution that fits easily into your daily life.